Like many other cancer patients, Melissa Thompson had a tough choice to make: If she wanted to live and have children, she would have to pay the medical bills for preserving her fertility while undergoing cancer treatment. Insurance companies for the most part do not provide coverage for preserving a person’s fertility. In Thompson’s case that meant a $12,000 bill, which she had to charge on a credit card as she started chemotherapy. Rep. Matthew Lesser (D-Middletown), also a cancer survivor who faced the same choice when he was diagnosed five years ago, has been fighting to pass legislation that would provide insurance coverage for fertility preservation. Finally, after five years of struggling to get a bill signed into law, legislation that Lesser introduced this session is on the cusp of being enacted. The House unanimously passed House Bill 7124 this week and on Friday the Senate approved the measure, which now goes to Gov. Dannel P. Malloy for his signature. Lesser said it was Thompson, whose undying drive and motivation in getting insurance coverage for others, that led to the passage of this year’s legislation. “This year I met an incredible citizen advocate, Melissa, through my colleague Rep. Caroline Simmons, and she completely changed the conversation, making a policy argument and telling an incredible and engaging story. Through her tenacity and smarts we were able to pass a good bill,” Lesser said. Sunday is National Cancer Survivor’s Day and for Connecticut residents the term cancer survivor has new meaning – one of hope, Thompson said. 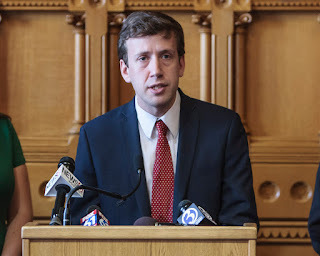 Lesser also credited Rep. Sean Scanlon (D-Guilford), Senators Tim Larson (D-East Hartford) and Kevin Kelly (R-Stratford), Insurance Commissioner Katharine Wade and the American Cancer Society for their support of the legislation. Editor's Note: The Middletown Insider will publish matters from both sides of the aisle. That does not mean we support it.